AT 27 YEARS of age, Clare musician Daithi O’Dronai has already been through more phases of his career than many manage in a lifetime. Developing from a young fiddle player to a reality TV show star, then onwards to a Sony-signed, offbeat-pop performer and finally a unique and soulful dance act, he’s a hard man to pin down. 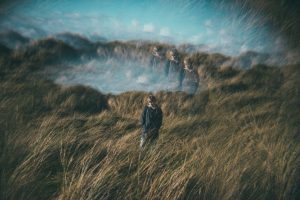 Recently relocated to Dublin, the man who simply uses the stage name Daithi’s latest incarnation is nevertheless a profound tribute to the rural roots that connect him tightly with the Burren, and Irish landscape. “When I was writing the pop stuff I was doing my best to write these perfectly little three-minute pop songs,” Daithi explains of his Sony album, and subsequent departure from the label. “I lost my angles. I enjoyed it at the time, but I kind of lost my identity,” he recalls. The departure from a major outlet like Sony was, no doubt, a tough call, but one Daithi made on the basis that he didn’t feel able to create things with purely commercial aims like radioplay in mind. His next single – a sentimental track called ‘Mary Keane’s Introduction,’ based around a dance remix of an interview with his 90-year-old grandmother – ironically turned out to be his most acclaimed. Daithi’s work is truly built from scratch. More specifically, it’s built from countless, heavily layered building blocks of ambient and atmospheric sounds that he’s recorded across the country. They include anything from the sound of the wind whistling through a gate up a Donegal mountain (a recording that took hours of battering by Irish winter weather, and one that’s his current musical plaything), to the subtle texture of the family fire, or the clang of pieces of cutlery bashing against each other in a rented room in Achill. He takes these recordings home, isolates the sounds and slowly builds up the layers of texture, throwing in some fiddle along the way, and adding numerous loops to give a form of dance that’s highly innovative in its origins. The mixing process is reproduced live on stage every time he performs. 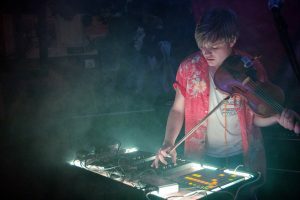 His current role as a fiddle-yielding, live-mixing outsider artist on a burgeoning Irish dance scene is all a very long way from a start that saw the teenage Daithi compete in the All Ireland Talent Show, and then go on to play Wembley Arena in front of a crowd of 10,000 for Sky’s ‘Must Be The Music’. With his constant push for innovation and love of integrating his field recordings, Daithi has a very real claim to be Ireland’s most unique current performer. Tapping into the very heart of rural Irish soundscapes, he’s bringing the subtly layered and carefully gathered moments straight to the dancefloor. Daithi’s latest ‘Holiday Home’ – inspired by solitary post-show, late-night drives down winding country roads – came out last Friday.